My husband and I are full-time travelers, so creating a list of ways to simplify your life seemed to only make sense. We’re always moving every time the next month rolls around, so carrying too much stuff would really slow us down (and would be pretty annoying too). We’ve found so many ways to simplify our lives because let’s be honest, travel can be stressful. We’ve had to create and learn new hacks to make things more simple, otherwise we’d get no rest. Now you may not be a full-time traveler like me. In fact, you may be a stay at home wife or mom, you could be working full-time, or you might be in college. But with whatever your life looks like right now, I know that all of these tips will seriously help you. They’re not in chronological order, so please feel free to pick the ones you know you can implement now and do them in the order that works best for your life. Then, watch as things become more simplified. There is one word out there that many people don’t like. In fact, some hate it. It’s been known throughout the generations as one of the most annoying words. And now it has been dubbed as politically-incorrect. The taboo word is… no. 1. If you’re working hard on a project at work and your boss asks you if you could take another one on, just let them know you can’t. Don’t be afraid that they’ll get angry or fire you. Just explain that if you take too much on, you know that you won’t be able to give the first project the attention it needs. They’ll understand, and this will save you from bringing the stress home from work. 2. Your friend or older daughter wants to know if you could watch the kids for a day because they have to run x y and z errand. But you have TOO MUCH TO DO. Just say no. Know your limits. It’s okay to have boundaries . 3. Your schedule has gotten way out of hand. You have to run your kids to practice, go to the doctor, work that weekend, clean the house, clean the car, run these errands, etc. Learn how to say no to certain things on your schedule. Have your kid carpool with someone to practice that week, know which errands must be done, find ways to be more efficient or avoid duplicating work and outsource some household chores to your kids. Only do the essentials or things will never get done (sounds strange doesn’t it?). Now remember how I mentioned outsourcing? Yeah, that’s gonna come in handy. My husband and I have been listening to a book on efficiency and lifestyle design called the 4-Hour Work Week . Tim Feriss’ thoughts on automation have seriously been changing the way we think. In order to get more stuff done in our lives, we need to outsource and automate. This will enable us to focus full-time on high value tasks that will help us feel like we’re moving forward – not treading water. Here are just a few ways you could do this in your life. You don’t need to be running a company remotely to benefit from parts of his philosophy. If you can automate the bills, fabulous! If you can pay the neighbor boy to do the lawn so you can do something that’s going to bring you more money or joy, great! If your daughter can walk the dog, all the better. By removing the low-value tasks you can free up mental bandwidth for greater clarity and productivity. This will enrich your wallet as well as the rest of your life. Last Note – Some of the tips throughout this post have been influenced by Tim Feriss’ book. He’s really changed the way we think and work. One of the best ways to simplify your life it to take a minimalist approach. And I’m not just talking about your clothing or house (although I will go into that). If you feel that you take too long on your emails, set certain times when you will answer them like 11AM and 4PM (and let your clients and coworkers know too). Minimize the time you spend with other coworkers so you can go home sooner. Minimize how long you spend on social media or on Netflix so you can truly do things that bring you life. Now for the home, DON’T DO IT ALL AT ONCE. Don’t do it! Take a room at a time (whether that’s one a day or a week), and start throwing or giving away all of the things you don’t need. Silas and I have moved a lot and you have no idea how many times we’ve had to downsize because we realized how much stuff we had.. and how much stuff we didn’t use. Start getting rid of things until there’s less clutter and the stress of trying to clean and keep things in order has been minimized. Earlier I mentioned about how my husband and I were reading books that would improve our efficiency and workflow. And if you want things to be more simplified, then definitely invest in a few. Start reading books that’ll show you how to make more money, advance your career, help give you a healthier thought life and relationships, boundaries with people that stress you out. Anything that will help simplify and improve your life. And as an added bonus, thousands of people have been wildly successful and then wrote down their thoughts and their stories in books. You can learn from them and duplicate their wisdom, mindsets, progress and avoid their mistakes. Sign up for our EXCLUSIVE book club starting in May! Our book club is all about leveling up your life. So whether you want to make more money, have better relationships, be more productive, or generally just live a better life, we'll have you covered. Do you ever remember reading or hearing about how Steve Jobs only wore one outfit everyday so that he could use more mental energy on other things? Well I’m NOT suggesting you do exactly that, but I am suggesting that you do something similar. These could be outfits you specifically bought for work or ones you already have. Either way though, it’ll give you more time in the morning to focus on other things. And don’t worry about wearing the same outfit every Wednesday (assuming you don’t mix them up a bit), no one is actually going to care. This is work, not a place to compete in fashion. In fact.. many of them are probably doing the exact same thing. This one is fairly simple. We all know that doing things the night before is a great idea, but an even better way to make sure you don’t spend too much time on one task is to set a timer. Make your kid’s lunches in under 5 minutes, make sure everything is in order to walk out the door in 3, prep breakfast in 10, etc. This way doing things the night before doesn’t seem intimidating. If you know how long it takes to do something and you stick to it, you won’t feel like you’re taking away from your night. So there’s this whole campaign out there screaming at you to “Stop buying more stuff!” And we get it, more is often times wasteful, but it’s hard to resist. And that’s why I decided I’d start the Two Weeks Challenge for myself. I learned that if I just waited 2 weeks to buy something (you can make it longer if you want), then I would know if I really wanted it or not. There have been so many times where I thought I really wanted something, but after two weeks… I couldn’t care less about it. This saved me from making a ton of impulse purchases and having things around my home that I didn’t even care for. Set this time in the morning, afternoon, and/or evening; any time where you feel like you can actually unwind and relax. With this time, you can be with someone who recharges you like a friend or spouse. Find a quiet place to read, pray, or zone out and drink a hot cup of something. Make it your recharge time away from the stress and noise. You have no idea how many times having a launch pad has saved me from searching the house trying to find my keys, phone, or wallet. A launch pad is simply a place (whether it’s a small basket or tray) where you can keep the things that are essential to have on you before leaving the house. Keeping things there is definitely habit you have to form, so don’t get too frustrated if you forget a few times. The average American spends whole days every year (if you add the time up) looking for things they can’t find, so definitely make your own launch pad. I love phone reminders because they pop up exactly when I need them to. This is especially handy when you’re trying to juggle phone calls and different time zones. Its also good if you feel like you’re going to forget something that needs to be done. They’ll definitely give you a sense of peace, ease, and calmness knowing that you don’t have to think about it. When it comes up, it comes up. Whether that’s a bill, a get-together, or a work related project, there’s no worrying that you’re forgetting about something. You deal with it when it reminds you. We’ve all know we’re supposed to do it, but so few of us do. It simplifies people’s financial lives so much that people who often do it and stick with it feel like they’ve got a raise. Setting up a budget is an awesome way to simplify your life. Planning what to do with your money is a great way to feel like your life is simple and calm. This reduces stress and makes it so that you don’t have to have that awkward conversation with your spouse when you realize you’ve run out of money before you ran out of month. Knowing exactly where your money is going eliminates the stress of not knowing if you’re going to have enough in the bank to pay your bills and meet your needs. You’re going to find that having a plan for your money and being confident you can stick with it will really help if anything happens. Moreover, you’re going to feel smart when you need to use your emergency fund for something and its there and you don’t need to go into debt with credit cards, borrow from your 401(k) or rob your savings for that all important life dream you’ve been setting back cash for. Many bloggers were writing their own lists of life simplifying tips, so I honestly couldn’t help it. It inspired me and I needed to show you and other readers awesome ways to do it. Its not always easy, and sometimes, it takes just a few time-saving hacks to get rid of all the noise and clutter in your life. 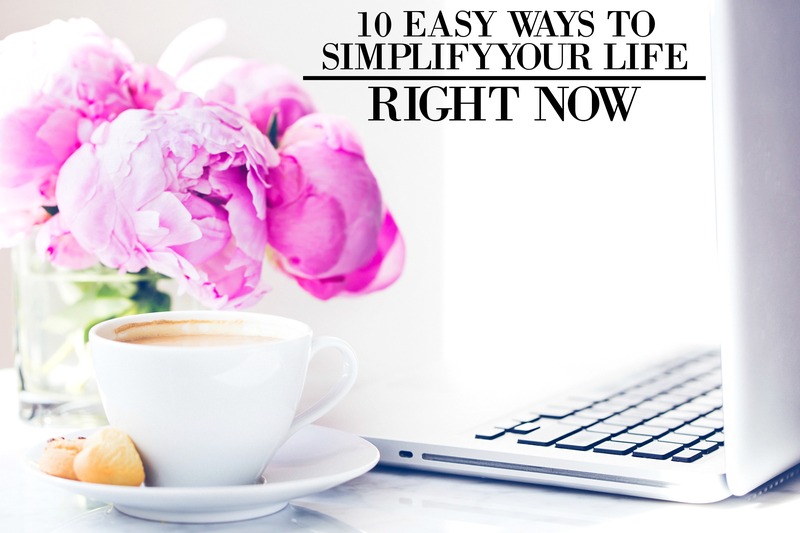 Now if you have any life simplifying tips and tricks yourself, let me know in the comments down below! I’d love to hear them!